That’s right: we have a new colour! Well, in fact this colourway was released at the Australian Sheep and Wool Show in 2013, but is now appearing on our website. 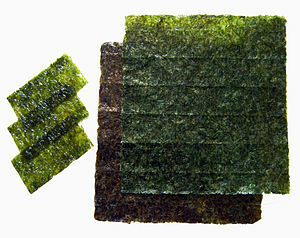 Introducing Nori, a semi-solid deep green, with hints of charcoal, emerald, chartreuse and kelly green. This colour was inspired by those wonderful seaweed sheets that we wrap around our sushi, or finely slice and use as a garnish on Japanese food. I love how this colour knits up – stay tuned for an update shortly where we use this yarn!